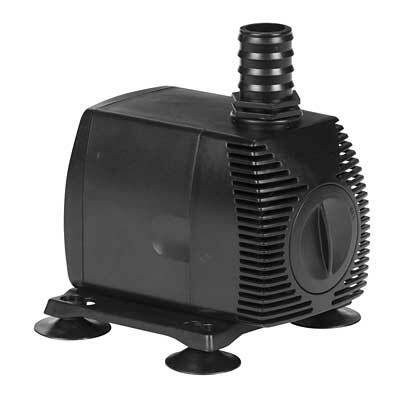 Add moving water to your pond with the Little Giant Mag-Drive Pond Pump. Magnetic drive pumps are specifically designed to operate continuously with minimal energy consumption, to handily create fountains or ornaments in your garden. These pumps are designed without seals, which can wear out, and have only one moving part, a ceramic shaft and impeller. Such design creates a low maintenance pump which uses less energy than a direct drive pump, and can potentially save hundreds of dollars over time. This sized pump is ideal for powering spitters, filters, and fountains, and is optimal for circulating ponds up to 800 gallons. A case screen helps prevent rocks and other debris from damaging the pump, and the ABS plastic, corrosion resistant body is made for non-potable submersible use. Four rubber feet on the base of this item help secure it inside your waterscape, and a flow adjuster knob on the front of the item lessens or increases your water flow to your liking. This environmentally safe unit has no oil, so there is no danger of it leaking into your water and harming your wildlife. Bring moving water to your pond in moments with this Mag-Drive Pond Pump. Three year limited warranty.